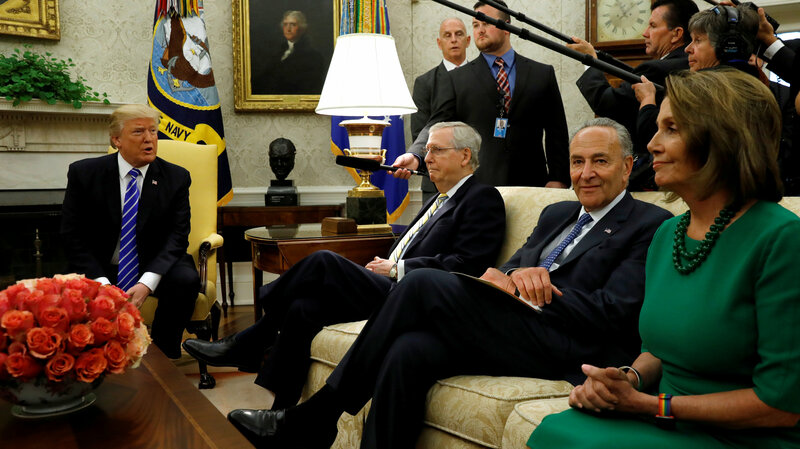 In one of the most shocking and dramatic turns of the Trump Administration, last week, in an extremely encouraging step toward bipartisanship, President Trump made a surprise deal with Democratic House and Senate Minority Leaders Nancy Pelosi and Chuck Schumer to help raise the debt ceiling. Further, now it appears they are all working together to help work out the Deferred Action for Childhood Arrivals (DACA) program for Dreamers. While this is certainly not part of the typical conservative policy agenda, it is certainly a step in the right direction as President Trump continues to defy all expectations that are set upon him. Perhaps what is most strange about this presidency is the unpredictability with which this president moves. He is not bound to anyone or anything, and in spite of the fact that he ran as a Republican, it is very clear that he is not easily defined, not even by the alt-right. It seemed as though many of those behind Donald Trump thought they could control him in order to see their own goals accomplished. Whether it was Anthony Scaramucci who thought he could use his Wall Street experience to smooth the Trump train; or Steve Bannon who thought he finally had the perfect figurehead for his alt-right fetish; or Rience Priebus who thought he could use the Republican establishment to keep many of the president’s darker tendencies at bay; even John Kelly who is currently dealing with trying to control an immature seventy-one year old. Ultimately, each man met the same end: no matter how hard you try, Donald Trump cannot be controlled. He will say things, he will do things that at times defy our logic and his own, but he will always follow the beat of his own drum. In the beginning of the Trump presidency, those who falsely thought they could control him were Republicans. Realizing they could not escape Trump’s immense momentum in the election, they instead tried to almost half embrace it with the classic political dance: do not say too much or too little; tip-toe around the real problem long enough and eventually the problem will be forgotten. A great dancer must work for many years to perfect their crafts and the Republican Majority Leaders in Congress figured they had done it for so long that neither of them could imagine any situation in which they wouldn’t have the upper hand. For a while, it seemed to be successful in getting President Trump to give them what they wanted. Neil Gorsuch was nominated to the Supreme Court, executive orders included revisions of Dodd-Frank as well as elimination of EPA funds and other conservative policy agendas which had been around for decades. He signed bills into law to undo net neutrality and he even withdrew from the Paris Climate Accords, something many Republican elected was a dream come true. However, in politics, things are not always what they seem. The Russian Investigation ramped up after the historic firing of James Comey. Soon Robert Mueller was named Special Counsel to the Russian Investigation and Trump berated his own attorney general over the issue. Healthcare also continuously appeared stagnant for months. The lesson to be found here is not so much in his willingness to adapt, but more so in his realizing that he no longer has to be controlled by anyone. What the turning point in Donald Trump’s thinking process was is hard to pinpoint, but what is clear is that he felt as if he could not get anything done while working just with Republicans and his own staff. Now perhaps for the better, he has decided to at least try and be a real president. He appears more and more bipartisan in perhaps one of the strangest parts of the Trump Saga yet. While the fact he is working with other members of Congress is encouraging, how long it will last is anyone’s guess. In spite of this apprehension, the lesson to be found here is not so much in his willingness to adapt, but more so in his realizing that he no longer has to be controlled by anyone. It is almost as if Republicans assumed like everyone else that Trump would lose the election, when he won the oval office, they thought they could simply control him and get the political agendas they wanted out of him. He was treated as a means to an end when he should have been treated like a loose cannon. So, when things got rough, the great Donald gave up on the conservative agenda and went to his own, whatever that might possibly entail. Republicans were given a hard choice toward the end of last year. While American politics have never seen someone like Donald Trump before, they had an opportunity to denounce him as a whole publically and back a candidate that had the experience needed to work in the white house. Instead they doubled down; they endorsed Donald and went to his rallies and to their surprise, he ran a winning campaign. Now they are simply dealing with the consequences, and I for one feel no shame in saying they deserve every hard ball they get. Ultimately if they wanted a traditional leader, they should have done what Ana Navarro did by backing the candidate who was already an established figure in Washington.